When it comes to great restaurants, you won’t find a shortage in Lake Geneva, Wisconsin. From fine dining to beachside snacks, there's a little bit of everything. Popeye’s is one that stands out among the others. It's big menu filled with specialties and staples has made it a staple in this beach town for over 40 years. In July of 1971, Nick and Veronica Anagnos had the idea to open Popeye’s Galley and Grog across the street from the beach in Lake Geneva. At the time it first opened, Popeye's, as it was later simply called was just a 60 seat pub. As the business became more successful, the couple continued expanding. They purchased adjacent buildings and put in more dining areas until the restaurant could hold 660 seats. Original owner Nick Anagnos passed away in 2011, but the restaurant continued without much change. Popeye’s is now being run by his children, Michael and Dimitri, in with the same traditions as their parents before them. As much as Popeye’s of Lake Geneva is known for it's food, the fully enclosed lakefront location makes it also a popular gathering place for drinks all year long. 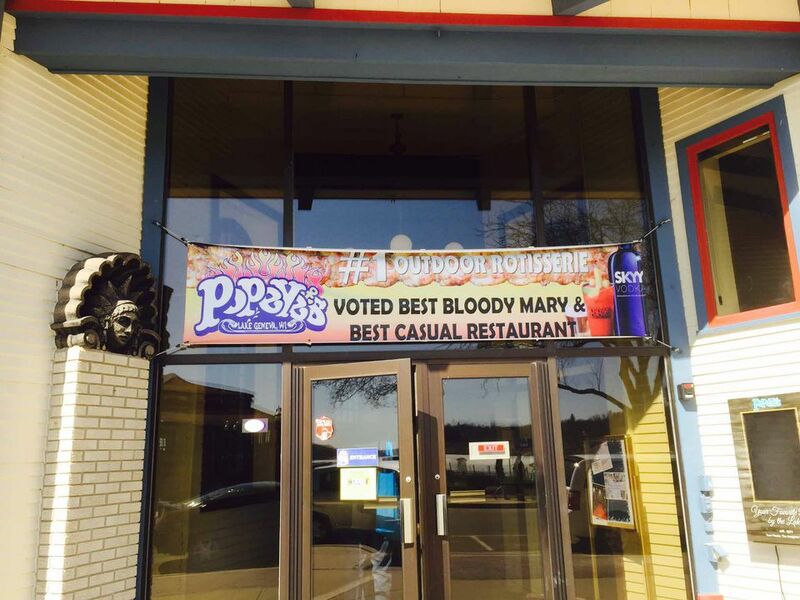 The Bloody Marys at Popeye’s are famous throughout the Wisconsin city for a lot more than Sunday brunch. The most popular is Popeye’s Spicy Bloody Mary, made with a house-infused tomato juice and a lightly spiced citrus vodka from Skyy. They also have six other Bloody Mary options for those who want to experiment with flavors. Popeye’s also has a Margarita menu and additional specialty cocktails, such as Jean & Amos’ Famous Mai Tai, made with a light rum, amaretto, and pineapple and orange juices, then topped with grenadine and a dark rum float. If you are looking to sample local beer, you can find a selection on tap at Popeye’s in Lake Geneva. They keep drafts from Lakefront Brewery, Geneva Lake Brewing, and Capital Brewery available at all times. Local Wisconsin wines can also be purchased here. You’ll find lots of burgers and sandwiches on the menu at Popeye’s, but some of these specialty items you must have while you are there, whether it’s for lunch or dinner. It’s rotisserie this Lake Geneva restaurant is best known for and they do it up right outside. It began being cooked here in 1985, paying homage to the Greek Easter tradition of the Anagnos family. They use a family recipe spice rub -- which is a secret they don't divulge -- and hardwood charcoal for this distinctive flavor. Popeye’s roasts lamb, pork, and beef, but the roasted chicken is considered the signature dish. Rotisserie is available on dinner plates and in combos, as well as in sandwiches. The pulled pork is amazing. Other items on the menu well worth a trip to Popeye’s is the Baked Brie -- available plain or with shrimp -- served with their popular warm, fresh rolls; the Reuben Sandwich, piled on fresh marbled rye; and the Broccoli Cheese Soup. Friday night Fish Fry is also something not to be missed by locals and visitors to Lake Geneva. As much as there is on the menu for lunch and dinner, you’ll also want to save room for Popeye’s desserts. Their Banana Cream Pie is the specialty. It’s creamy and delicious, with fresh bananas and whipped cream. Popeye’s Restaurant is located at 811 Wrigley Drive in Lake Geneva, Wisconsin. It’s just across a short street to Riviera Beach so it offers amazing views of Geneva Lake, regardless of the season. Don’t let the term “Midwest beach town” keep you from heading her in the winter. Like many places in Lake Geneva, Popeye’s is open at 11:30 a.m. seven days a week, all year round. The restaurant is extremely family-friendly so it’s a perfect stop on your Wisconsin vacation, whether it's a special occasion or a weekday dinner. Read reviews and find hotels in Lake Geneva at TripAdvisor.